Sandy beaches provide a natural barrier between the ocean and inland communities, ecosystems, and resources. However, these dynamic environments move and change in response to winds, waves, and currents. During a hurricane, these changes can be large and sometimes catastrophic. High waves and storm surge act together to erode beaches and inundate low-lying lands, putting inland communities at risk. A decade of USGS research on storm-driven coastal change hazards has provided the data and modeling capabilities to identify areas of our coastline that are likely to experience extreme and potentially hazardous erosion during a hurricane. 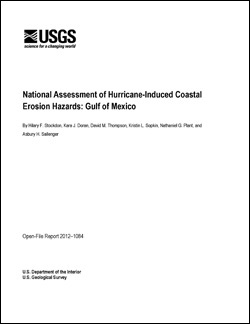 This report defines hurricane-induced coastal erosion hazards for sandy beaches along the U.S. Gulf of Mexico coastline. The analysis is based on a storm-impact scaling model that uses observations of beach morphology combined with sophisticated hydrodynamic models to predict how the coast will respond to the direct landfall of category 1-5 hurricanes. Hurricane-induced water levels, due to both surge and waves, are compared to beach and dune elevations to determine the probabilities of three types of coastal change: collision (dune erosion), overwash, and inundation. As new beach morphology observations and storm predictions become available, this analysis will be updated to describe how coastal vulnerability to storms will vary in the future.